Afternoon Loverlies! Last week I read two books within like three days. One of them I read in one day, that's how easy of a read it was. Plus I was also very much into reading it. lol These books were very good. I think they are worth owning. I have such an obsession lately with just loving books. If they have that pretty color of course and if they just feel good in my hands. Even the classics, some of them I haven't read yet. I never had to read The Scarlet Letter or Wuthering Heights in school. I want to read them though, they look very interesting. 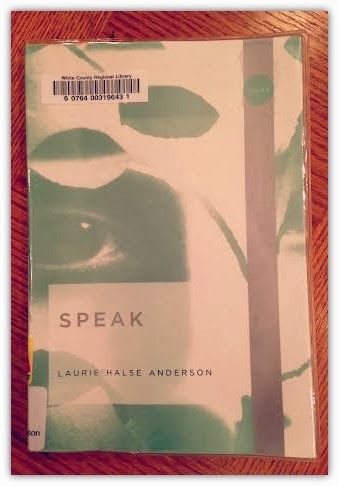 The first book I read this week was called Speak written by Laurie Halse Anderson. One of my friends said he had to read this book in school even. I think I might have been out of school when it was written, I don't know. I didn't pay attention to when it was written. lol There is even a movie based on the book that came out in 2004 starring Kristin Stewart. It was even pretty good. They of course left out some scenes and details. This book is about a girl named Melinda Sordino who was visiting a party one summer with her friends. She came across an older guy who raped her at that party. After that summer she just kept to herself, because it was hard for her to speak of what happened. Her friends and the whole school were basically mad at her, because after the incident happened she called the cops. She was basically confused what she was supposed to do. Everyone thought she was calling the cops on the party. Throughout the book Melinda takes an art class, and slowly the art helps heal her a bit. You will have to read it to see how it ends up. ;) Very sad story, but it was a good one. A story about being brave. 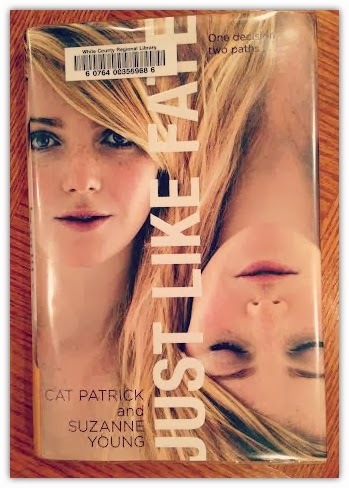 The second book I read was called Just Like Fate written by Cat Patrick and Suzanne Young. This book started off where I thought it might be a confusing book. Because of how it is written. Turns out I love it even the way it is written. It's still an awesome story! It is about a girl named Caroline. Her grandmother has been battling cancer and seemed she was getting better, but then she has a stroke. Caroline was very close to her grandmother, she has been living with her the past 5 years since her parents divorce. Her grandmother was like a mother to her. Here is where it can get confusing. While she is in the hospital waiting on her grandmother to wake up from the medicine a little bit to talk with Caroline and her family. She get's a call from her best friend asking if she will come party with her. To help get her mind off of things. Even though her grandmother is dying she has two choices to either choose to stay or go to the party. From this part on it starts off the next chapter if she stayed, then the next if she went to the party and so on. That's where you might get a bit confused. But it actually wasn't that bad at all! I really enjoyed the book so much I read it within a day. It was easy to get into and kind of like reading two stories at once. Each fate had the same guys she liked, but she was with one of them in one fate and the other in the next fate. I was curious how it was going to end. But I will not spill how it ends. Y'all will just have to read it for yourselves! :) I really enjoyed it though. Especially for a non supernatural book. Now on to the next books I need to read. lol So many to read!! Love it! Ta Ta For Now!